Are you getting ready for a teacher interview and maybe you have no idea where to start? What kind of teacher interview questions will there be? There are a ton of teacher interview tips out there and I’m glad you are reading my post about teacher interview tips, questions, and answers! What to wear to the interview? I am a big believer that you should dress for the job you want and not for the job you have. If you can- wear a dress or a skirt with a nice blouse. Otherwise wear nice dress slacks with a nice blouse. For gentlemen, you should wear nice pants with a long sleeved shirt and depending on what you are comfortable with you can add in a tie. You are making a lasting impression so you don’t want to wear scruffy stuff. You are showing the interviewer what to expect if you were to be hired. Each time that I have had an interview, I have experienced many different questions. I am going to list all of the questions that you may be asked during your interview. Be mindful that these are not all of the questions, however, this is a great starting point. I will not be giving you the answers because each teacher is different. Each classroom is different. This is all based on you and what you do in your classroom. What grades have you taught or student teach? What subject is your strength? What does your math block look like? What does your reading (or ELA) block look like? What PBIS or PBS strategies do you implement in your classroom? Do you know what Social-Emotional Learning (SEL) is? How do you incorporate SEL into your everyday lessons? How do you incorporate technology in the classroom? What do you use the technology for? What is your parent relationship like? How do your parents respond to you? How do you build trusting relationships with your students and their families? What is the customer service like in your classroom? These are all fantastic questions. Practice answering the questions with a partner or a fellow teacher. You can perfect your interview responses prior to going on the interview. Have you been asked any questions on your interviews? I am dying to hear! So I jumped on the Boom Cards train. I, 100%, completely jumped on it. Boom Cards has an awesome Boom Cards App that you can use for your students or you can just use their website. As you know, I love using technology in the classroom. In fact, I love having the ability to do math projects on Google Slides. Half way through the year, I discovered Boom Cards. Honestly…between you and me…I was seriously frustrated. The website was very difficult to navigate until I decided to sit down and work through this website. It was a ridiculously hard task to overcome. I also would like to put out there that I am really good with technology. After I figured out how to redeem cards and give the cards to my kids- I fell in love. It was just like Google Slides…except I don’t have to grade anything!! Seriously. Most of the cards already have the answers built into them and you don’t have to do anything but look at their score. I like to open the cards and look to see what the kids answer and why they had a mistake or what they did on the cards. I have the kids type in the answer under the picture and then it makes this adorable DING sound if they got it right. It makes a different sound if it is wrong. Why did I decide to make the change from Google Slides to Boom Cards? Being completely transparent…I was tired of grading the Google Slides. It was super easy to grade BUT it was just another thing to grade. When I used Google Slides- I would have to go through all 24 of my students 24 slides and grade EACH piece. One of the math projects had over 60 problems. That is 1,440 problems to grade…by…my…self. Not only that- but I am able to see where students are having a disconnect pretty quick after they enter the information. When a student struggles, I can instantly see if there is a skill a student is struggling with. Unlike in Google Classroom- I take forever to go through them. Another reason I really like Boom Cards is because now my kids can get that instant gratification. It may sound silly but really it’s AWESOME! They are able to see when they don’t understand the skill instantly. The kids are able to come to me and tell me that they don’t understand. It holds the students accountable! In fact, my kids now tell me- I tried this and this answer and worked it out like this. Then I can actually help them solve. No longer are they waiting DAYS or WEEKS to get the answer and see what they did wrong. I wanted to give you a free set of one of my Boom Cards! It is multiplication word problems and you can redeem this and try Boom Cards out yourself! Click the picture below to go right to the free Boom Cards on TeachersPayTeachers! 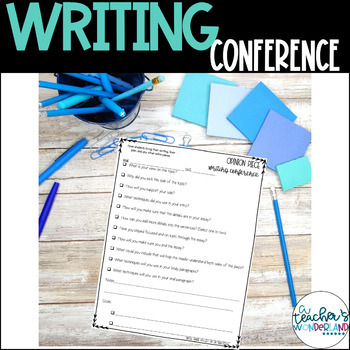 Have you been told that you HAVE to have writing conferences but you have absolutely no idea what to do? A few years ago, I was told I needed to have these conferences and my response was “what do I even say to them [students]?!? !” I must have looked at my trainer like she had ten heads. Seriously. She probably thought “this one will be done with elementary soon enough.” Surprise- I’m still here! I didn’t know what to do. Then I started to just talk to the kids. It’s like I was scared but writing is so hard and how can you just “talk” with them? Well I figured it out…kinda. I ended up allowing myself to ask what their story was about. I started there. I wanted to hear what they were writing about but I also wanted to know WHY. I was intrigued by some of their stories and why they were writing them. I started with my base question…what. What are you writing about, and when why did you decide to write about this? It really opened up my conversation with the students and I was able to discuss with them how their story progressed. I could also guide them with the different ideas from what they said to me. I can show how that idea made them feel. I would really try to put a different perspective on it for the students. This turned into an entire writing block. I have to say- I fell in love with it. I loved being able to listen to the stories, or discuss it with the students. I loved hearing about a life that I haven’t seen. I loved being able to push them further than they could have ever been. I had open discussions and discussed so much that I couldn’t keep track of it. Seriously- it was crazy! I ended up creating Writing Conference notes because I was tired of all of these post it notes all over my desk or all over my binder. At one time I did use a notebook but the post-its were falling out like every other day and I was tired of chasing them. I created my notes to use in my binder. These have been incredibly helpful to use in my classroom on a day to day basis. I also needed some to use during our state testing time. We write about an opinion piece and a informative piece. I created conference notes to guide me as I was speaking to the students. I was able to keep track of all of my questions without worrying if I forgot anything. The conference notes take me all the way through from the beginning to the end. Once I meet with them, I try to meet with them again a few days later. This allows me to follow up with them while asking different questions on day 2 of the conference. Want to purchase these conference notes? Click right >here<. If there is something missing- let me know and I can add it for you! Are you bored with the Rock Cycle because you have no hands on activities to help the students understand the process? Well- luckily for you, I have an amazing science project that sticks with the kids…literally and figuratively! I really wanted a way for the rock cycle to stick into mu student’s brain. I went to Target and got 2 bags of starburst. Let me give this advice- get the regular starburst. I bought the red faves and unfortunately it was too similar in color. It worked- but it’s just a little easier for you. Give each student 3 different colored starburst. This will be really easy for the students to decipher the layers. Place the starburst on a hard object like a desk. Using pressure, push really hard on the starburst so it is practically flattened. I like to show the kids that they can see my palm prints in the starburst still. Then generate questions to ask why? Then I like to make an initial in the starburst. I used the letter W because it’s pretty wide and will be easier to identify later on. You can use your thumb nail to make the W or you can use a pencil to make the W.
Next using heat and pressure- you will flatten another starburst. (Color 2) How do you use heat in a classroom? Use deep breaths to blow on it and then press. Blow then press. Blow then press. Blow then press. You will want to do this a few times so that students can flatten it like the first one. Place the starburst lightly on top. Do a gentle push so they “smush” together. Do the same for the last starburst! Now you have sedimentary formation. The starburst formed a layer of sedimentary rocks. The students are able to see a visual layer of sedimentary rocks in their very own hands! Now- “accidentally” break the rock. It’s super simple- just pull off a corner. Then have all of the students pull off a corner. You can have all of the students combine their “corners” and join together. This will become a new type of rock. You can easily take the sediment and just leave it out or combine with others. Just make sure you break it because that will allow you to teach how sediments can be created. Sometimes I like to get really dramatic and say OH NO TIDAL WAVE! And make the sound and break it. It is quite fun! Ask the students- is this the same as it was? Will I be able to get it back into the original shape? Not unless I worked at Starburst’s factory. Then I lead them back to ask- what about rocks. Will they be able to get back to the original rock that they started from? Why not? Weathering, Erosion, and Deposition are some key words you should be looking for on that one. Ask the students if they will now be able to get it back into the shape. Now with some heat and pressure I was able to make it into a metamorphic rock. I do allow the students to take apart the starburst so they can find their letter that they made on the first layer. Can you see it? Look for places that are dented in. If we something sticking out like maybe a paper clip- we would be able to show the students that the rocks formed around the paperclip. This works just as well because the students can see that the letter is still there. They can see that the letter may have been stretched (which normally doesn’t happen to rocks) but in this particular instance it did stretch. It really is a great thing for students to recognize about fossils. I hope this gave you ideas for you to use in your science classroom! It really is a great lesson. I did not get into igneous rock – I couldn’t find a volcano in Florida. Just kidding! This was really for sedimentary rock to metamorphic rock while understanding how fossils can me made and fossilized. Y’all. I love picture books. I cannot lie. I am obsessed with the power behind picture books. Not only do picture books change the way we read texts, but they also allow your students to step foot into a book and get lost. How do I choose my picture books? Choosing a picture books can be very tricky. I normally go through about 30 books before I find the top 4-5 books that I love and want to use. The first thing that I do is I set up what I want my skill to be. When I have that in mind, then I go through the picture books and find the book that will support that skill. I also need to think of if I want a fiction or nonfiction book. This helps guide my thoughts as well. Here is my example for you! I wanted a book that supported the text structure of sequence or chronological order. How can I find something like that that is also not a biography? Well, I go to the library. I spend easily an hour or two there. I open so many books and then lay them in front of me. Then I am able to see if there are any books with timeline in them. Are there any other text structures that I could possibly use to support the lesson? If so, what are they? If I am able to use it multiple times it will then become a mentor text. It will allow the students to keep seeing the text over and over again. Lastly, I mark the text up! I love putting post it notes all over the book. Usually once I find the book I want to keep, I purchase it through amazon prime so I don’t have to keep going to the library and can leave my notes in it year after year. How do you choose picture books for your lessons? Math groups are a great tool to use in your classroom. It’s a great way to see your students in a small group setting and it allows you to understand the mathematician in you classroom. Small math groups are a relatively “newer” concept because counties are recognizing the importance of meeting with students in small groups on a daily basis. Of course teachers have been saying this for many years and people are just now starting to listen. What are some of the benefits of small math groups? Yes, there may be more benefits, however, these are some of my favorite reasons why I love small math groups. Understand students more- This is huge for me because I want to know my students. Not just at an academic level but it also allows me to build up the trust and relationship with the students. I am able to ask about previous years, if they like the skill, and how they feel about the skill. I can build trust with them and help them understand that I am there to support their learning throughout the process. When I meet with students I am able to close any gaps in their learning. For example, I had a student that struggled with adding fractions with unlike denominators. I had to stop, reevaluate my teaching, look at what she knew and recognize that she didn’t know how to do basic adding fractions with like denominators. I was able to close the gap because I saw where she was lacking in the skill. Identifying strengths and weaknesses is probably my favorite part. When I see a student that is REALLY good at a specific skill, I make sure I take a note on the skill they are strong in. Then if I see another student struggling, I send the successful student to strengthen the skill for the other student. Not only do I build up my relationship with that student, but I am also building up their confidence. I am showing my student that I believe in them and that they can help other students. I also am pushing my students to become that “level 4” on the scale. To me, a level 4 on a scale is when they can teach the skill. Able to group by levels. Some people are against this but when it comes to math groups (guided math) I am a believer in it. We are in math rotations and not in strategy groups. The reason why I put them by level is because let’s say student A is really good at fractions and can finish the math problem in about a minute. Student B struggles with fractions and sees students A complete the math problem and then go off and complete the classwork. How does Student B feel? Are they going to be upset because they saw someone else get it right away? ABSOLUTELY. We need to build some of our students confidence and show them that they can complete the skill! Try to group students by levels so that they are the stars in their own groups and don’t think low of themselves. Scores will go up. The more you see the students the more you are closing gaps. You are able to catch any simple mistakes that the students make. Instead of them making the mistakes right away and then you catch it when you check homework- you are now able to catch it during the small group. You are able to identify any small mistakes that they make during groups so when they go to complete the classwork or homework they won’t make those simple mistakes. I can’t wait to hear how you use small groups in your classroom! Leave any questions in the comment box below! Every year I plan EVERY SINGLE SUBJECT. It’s so hard. I have gotten better as I’ve stayed in grades longer. I also have learned so much about myself as well. Recently, I learned that I like all of my lesson plans done. 🤭 I am not just talking about math- but I am including reading in there as well! I was tired of waiting until the last minute to find a book. Tired of finding picture books to go with the skill. Tired of writing lesson plans year after year. I don’t want to go through the stress of finding higher order questions through EVERY book. I stopped the cycle. I no longer torment or torture myself anymore over reading plans. I now use my new Dive Into Reading lesson plans. All of my lesson plans are done for me. All of my vocabulary words are done and even defined for me! All of my questions AND text dependent questions as well are done for me. No longer do I have to worry about lesson plan writing time. I actually have all of my reading lesson plans done! It’s truly amazing and I am beyond proud that I now get to leave on time because I’m not spending hours upon hours writing my lesson plans! The February advice Into Reading until is geared around social issues. It’s great for kids to see different perspectives that they normally might night see. They also are themed based on what the month is about. A lot of tome in 5th grade you can’t always have a “themed” book because – well- you have tests. I found a way around that. I included two books that are about civil rights AND teach a skill. They also allow the teacher to teach about history as well which sometimes is passed by. The chapter book as well goes with the picture book and supports the theme. In February, our chapter book is The Watson’s go to Birmingham. It’s a truly amazing book and Christopher Paul Curtis pulls you in with the first chapter. The second chapter book we read is Number the Stars. Lois Lowry makes you believe that all of the story is true. You want to fight for what’s right based on both of these books. Both of the books are thought provoking. All of the chapter book questions are provided for you. You can also print them on sticky notes (templates provided) and insert them into your book and go. All vocabulary cards are a quick print and cut. Want to give sticky notes for reading responses? Print them on Avery labels and Voila! Your reading response or text dependent questions are now easier than ever to respond to! What books will you use? There are actually six picture books for this unit. The skills we will be tackling are overcoming obstacles, zoom in moment and using schema, views about the same topic from two different point of views, and inferring feelings while providing evidence. How do you hold students accountable with all of the skills being taught? Allow them a place to collect their notes. They will doodle their notes and write their answers on provided doodle note. While you are teaching, the students get to go over the skills as well. Review and get a hands on feel while working on the skill. This Unit May be favorite unit of all of my Dive Into Reading units. I absolutely love The Watson’s and I feel like the students learn so much from the characters. My mommy always said work smarter, not harder. Well- now I’m allowing you to work smarter by using all of my lesson plans. You heard that right, all of my reading lesson plans are done for you. All you have to do is go to my TpT store and check out all of my Dive Into Reading units. You deserve to go home on time. Don’t stay late anymore. My lesson plans are done and guess what- your lesson plans can be done for you as well. We all want a welcoming classroom. Even if you are a teacher that doesn’t “care” about how the classroom looks- you still somewhat care. Teachers are always looking for ideas for bulletin boards and there was something I learned about myself and bulletin boards. Well actually there was a few things. I don’t LOVE putting them up. I LOVE making motivational bulletin boards. I want here to a message that will go with the bulletin board. I put this up around diagnostics time and I knew that those 4 words were already making a difference. I looked at students work and almost every student somewhere in the test wrote the word “believe.” I never specifically harped on the bulletin board and I just put these words up. These words really seemed to hit home for kids that I never thought needed it. That was when I realized that kids have things going on that we have NO idea about. So how could I come up with other ones? Well I created the “smarter” bulletin board and honestly- I was surprised by how the kids reacted. 1st Graders would tell me that they were super smart because the “wall” told them. Students from 5th grade would constantly read the bulletin board. Not only was it something super simple to do but it made a difference. The words were motivators for students to do their best and honestly…to believe in themselves. The sad part about this post is that this may be one of the only times in a while that someone actually believes in a specific student. You never know who your bulletin board can affect and can make their day better. Your words mean something and I know that a positive message on a bulletin board can really make a difference. So here is my question for you…will you go and change your bulletin board to encourage your students? A lot of people ask me- how do you select a read aloud. It is not an easy task and there is quite a bit of criteria that should go into selecting your read aloud. When I select a read aloud, I make sure I only look at books that are a year ahead of where they need to be at the current time. Here is how it works. They come into 5th grade reading on a level S (IF they are on grade level). I still do a year ahead even if some are behind grade level. If it is August and when they enter Grade 5 they should be reading a Level S- in a year August- they should be reading on level V. The books I select are one year in advance so it’s a level U or V. As the year progresses- I move through the levels. Now- this is how my district wants it. I don’t agree with the leveling system but this is how we have to do it. In addition to one year ahead- I like to make sure I hit every single genre throughout the year. It is a really hard task (especially with nonfiction) however- if you look you will find. I search for a long time finding books that will go with a theme. They aren’t always a cohesive book with the theme however- the chapter book (read aloud) ALWAYS goes with the mini-lessons. The last thing I do is I read the book. It sounds silly but I have met several teachers that looked at me like I was crazy when I said I read the book before hand. There are several reasons why. If I don’t like it- the kids probably won’t either. If I don’t read it-how will I know the skills to tackle? It is super important that you read the books. I have heard of GREAT books and then when I read it- I can’t get into it. Or…they are written as poems and that’s too hard for them to understand. OR there is cursing or using inappropriate language. It’s always best that you read the books first. Just to recap- here are my top 3 things to do when selected a read aloud. Level it a year above where they need to be. What are some tips that you may have? Leave a comment below so others can see great ideas!